The net connection was really bad for the last two days. It was down on Sunday and when it got back on, it seems to have slowed down a lot. It was down again last night so I went to bed early. Maybe it was back in the middle of the night, dunno! but it was ok this morning. If I delayed on emailing tutorials to you for the last two days, I apologize but I am blaming Telekom for the delay. I hope it will get back to normal soon. To perk up the day, here is another purple-themed bracelet to share with you. Since X'mas season would be here soon, I will be announcing X'mas Sales for items on my Etsy Shop very soon. Labels: Bracelets | Cuff , Offwire Rambles , Wire Jewelry Share it! 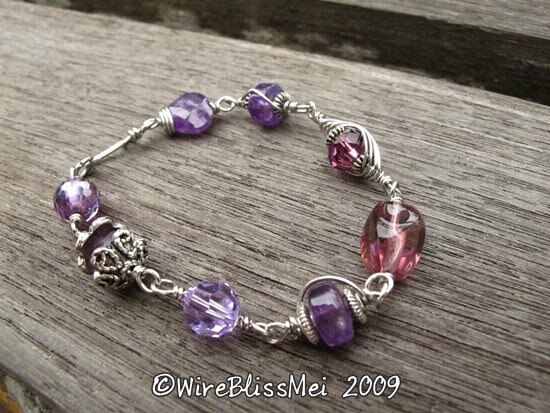 Love this bracelet Mei...purple is my favorite color!! !